In the spirit of motivation – and to hopefully help you lead by example and build trust with your teams in the year ahead – we’ve created a downloadable poster with 52 of our favorite quotes on leadership. Topics range from employee engagement and authenticity as a leader to teamwork to building trust, and having the courage to lead. Since there are 52 quotes – we encourage you to pick one a week and use it as inspiration as you continue to advance your leadership skills. You can print and hang it in your office and/or share with colleagues and friends! 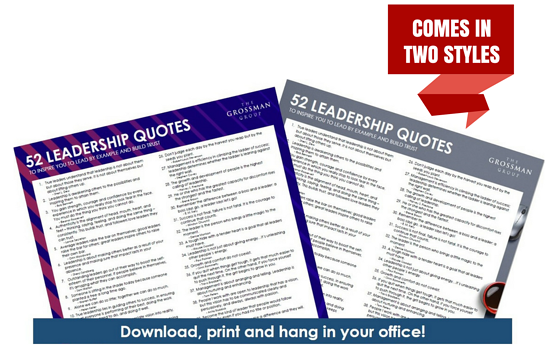 Fill out the form to the right to download your FREE copy of our "52 Leadership Quotes to Inspire You to Lead by Example and Build Trust" poster, today! You’ll have two design options to choose from; pick one or both. NOTE: The poster is designed to be printed on 11"x17" paper, but can also be printed as an 8 1/2"x11".